This book cover, by Ol'ga Deineko, could double perfectly well as a propaganda poster. In the center of the cover image is a physically robust young man, presumably the ideal reader of this manual, dressed in the kind of simple, functional working clothes that were being designed by Constructivist leader Vladimir Tatlin in the early 1920s. 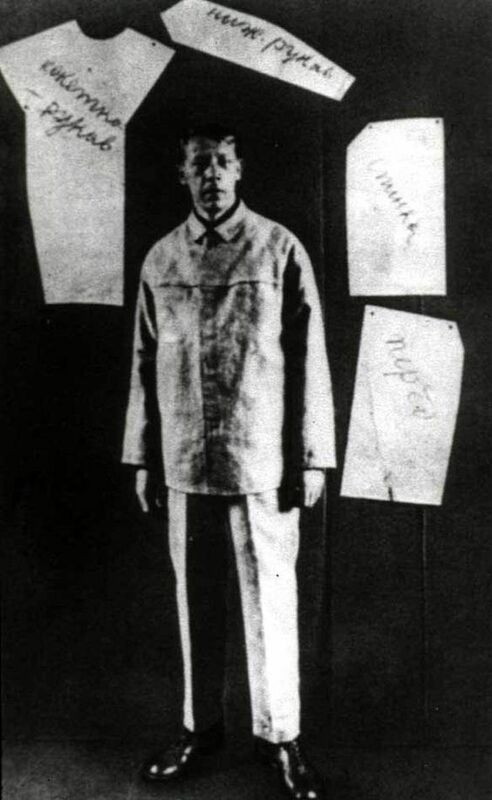 Vladimir Tatlin in one of his worker suit designs. The youth holds a banner in his right hand that proclaims “Youth, Go!,” his left hand is clenched in a fist, and he is slightly crouched, as though in the starting blocks for a race. The tension expressed by his pose, the bold colors and the slogans all convey a sense of urgency. The cover’s use of primary colors, geometrical shapes and impactful fonts are all typical of Cubo-Futurist style and contemporary poster art.